While at the Sundance Film Festival this past week I had the fortune to to see the premiere of “Whose Streets” by Sabaah Folayan and Damon Davis – produced by Jennifer MacArthur. It was even more fortunate because I was able to view this powerful film on inauguration day and it provided wonderful counterprogramming. I was struck by a number of things in the film that still resonate with me almost a week later. 1. The film shows how far we still have to go as a nation to confront a legacy of slavery that is still with us. The film wisely starts with a reference to the Dred Scott decision in 1846 and compares it to contemporary St. Louis and Ferguson. (In the Dred Scott decision, the Supreme Court in one of its most notorious decisions, declared that since Dred Scott was a slave he was not a citizen. As such he did not have a right to sue for his freedom even though he lived in a non-slave state.) This initial juxtaposition, along with the quotes from prominent black leaders that served as chapter breaks, was all the contextualization the audience needs. Very soon we see the largely white police using overwhelming force to intimidate and control the primarily black citizens of Ferguson. The dogs used for “crowd control” is enough to throw you back to the 60s and beyond. 2. The film does an incredible job of constructing the story of people living through the aftermath of Michael Brown’s death focusing on four activists: Brittany Farrel, David Whitt, Tef Poe and Kayla Reed. 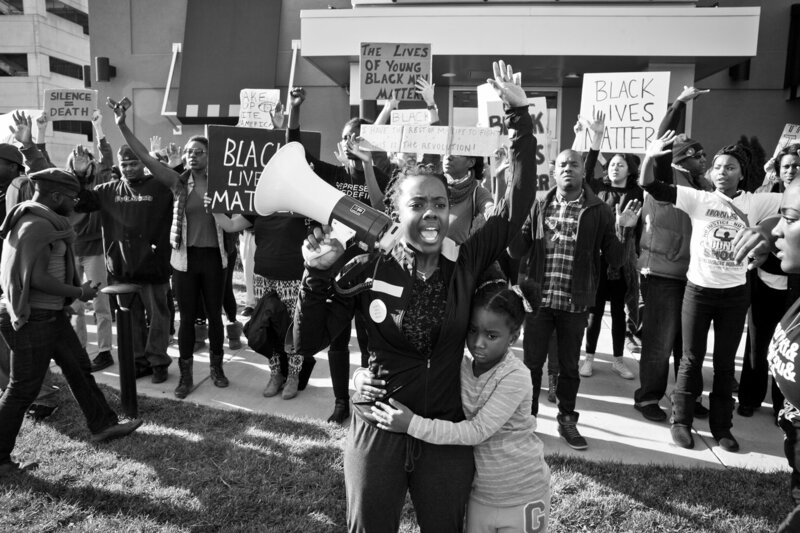 Weaving a narrative from a wide range of filmed and archival/cell phone material the filmmakers provide a visceral experience where you feel that you are there on the streets with the mourners and protesters. You live the events with them, and see how truth unfolds through their eyes. 3. I believe it might have been the LAPD under Daryl Gates that spearheaded the militarization of local police with armored battering rams being used in the early 1980s. (http://www.laweekly.com/news/the-militarization-of-police-started-in-los-angeles-5010287). The film Do Not Resist (http://www.donotresistfilm.com/) which came out last year, uses Ferguson as a backdrop to examine the increase in militarization of police forces across the country. But Whose Streets is the first film that I have seen that gives a sense of what it is like for American citizens conducting peaceful protests to come face to face with police in full combat gear flanked by armored personnel carriers. Our founding fathers would be aghast. 4. I like to feel that I am a savvy media viewer – but the contrast presented by this film between the stories of the people on the ground and traditional news media was stunning. As shown in Do Not Resist, the events of Ferguson have been used as a justification to increase the militarization of police forces in the US. But Whose Streets deftly shows the distortion of the mainstream by constructing the reality of events as witnessed by those on the receiving end of force. There is much talk about media bias these days and real stories not being told. Somehow my bet is that most of the untold stories and media bias is of and against the marginalized. 5. On the bus after the screening a white women commented on how she felt that there should have been many more interviews with white people to broaden the appeal of the film. But why does a film about black experience in America need to be mediated by white people? I think she perhaps missed one of the key points of the film: having a lived experience of how racism in American society has stayed embedded in our society. I was inspired by the bravery of the activists in the film and their families in the face of such intense opposition. The film shows through the lives of Brittany Farrel, David Whitt, Tef Poe and Kayla Reed how difficult the struggle for human rights can be. Coming at a time when our country is facing an attempt to push back gains made across the board in civil rights, women’s rights, environmental protection, etc., the film is a much needed inspiration for activism and the need for continued struggle.